The Cosmopolitan Music Society (CMS) is the program of excellence for community music education and performance. CMS is a community program in pursuit of musical excellence. Delivering band and choral programs with professional instruction at all levels. Providing performance opportunities for member and public enjoyment. Collaborating within the larger music community for mutual growth and development. Attracting people from all walks of life who come together for an enjoyable, enriching experience. The pursuit of musical excellence and quality. Personal accountability, responsibility and commitment. A sense of community within CMS. Contributing to the greater community. 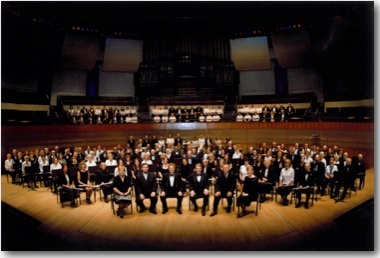 Operating since 1963, the Cosmopolitan Music Society's programs include community concert bands, a community choir, and a beginner band. The adult beginner band program is designed for those who have never learned to play a wind instrument before or who played in school, but who’s skills have lapsed. The program begins in early October with small group lessons of like instruments with a professional instrument instructor (e.g. the clarinets meet with a clarinet instructor, the flutes with a flute instructor in another room, etc.) Once some rudimentary skills have been learned, the ensemble starts to rehearse as a group. They learn musical notation as they learn to play their instrument, using increasingly difficult music as motivation to continue to learn. They play their first concert (a small portion of another ensemble’s concert) in the spring and have the opportunity of a lifetime to play on the stage of the Winspear Centre in June. At this point, members are encouraged to audition for the novice band to continue their practice. The concert bands are designed for adults who learned to play wind or percussion instruments at some point in their lives (often junior and/or senior high school) and wish to continue. There are three levels of bands: advanced, intermediate and novice and each ensemble rehearses on a different evening of the week. Members wishing to join are placed into the various bands after a simple audition with the Music Director. Advancement between bands as skill levels increase is possible, again through a simple audition process. The Cosmopolitan Chorus is open to adults of all ages who love to sing and enjoy singing in a group setting. Singers of all skill levels are accepted. A voice placement appointment is made with the Chorus conductor to determine vocal range and sight reading ability. All of the ensembles rehearse once a week from September to early June and have the opportunity to perform approximately four times per year. All of the members enjoy the social atmosphere of their ensembles while improving their skills under the direction of professional conductors. A varied repertoire keeps members interested and challenged by the different skills required for different types of music.